The three applications included in Google Docs have never been properly integrated and there's always an interesting feature that is only available in Google Spreadsheets or in the word processor. 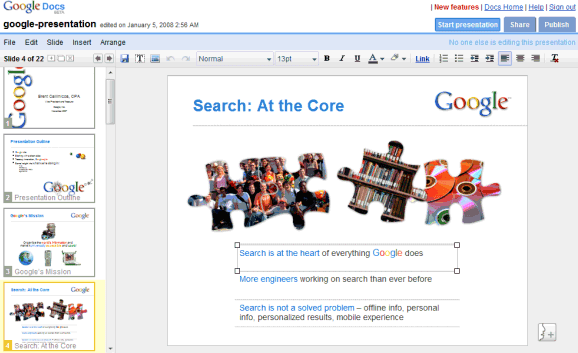 Google redesigned Presently and added the old-fashioned menu already included in the word processor. The interface have been streamlined and there's more room for editing slides. A notable new feature that can be found in the Slide menu is zooming in/out, but the keyboard shortcuts aren't very intuitive: Ctrl+Shift+left/right arrow. What's funny is the interfaces are still not the same for both the Doc editor and Presentation editor. There are obvious differences. Why don't they make all four interfaces (docs, spreadsheets, presentations, and pdf)the same? They also need better integration into other Google Services. Anyone else feel this way? They also enabled RTL writing in Gmail at all languages and upgraded many languages into Gmail 2. Agreed, the interfaces need to be unified - they're slowly getting there, but what's taking so long? Also, they need to open up both the themes (and unbury the themes option from the Edit menu - why put it there?) and shapes as well. Why the limit to ~dozen of these? Like iGoogle designs, themes and shapes really need to be opened up to the community so others can create or share their works. Lastly, whatever became of the Tonic Systems acquistion? Looking at some of the old screen pics from their service from this blog, they had tons of graphics capabilities and options for advanced editing, etc. But, I see none of this in Presently. One of the biggest integration problems with Google Docs (or maybe I am missing it) is not being able to add a document from an email within Gmail. Along with "Attach a file", there should be a link "Include a file" which would give a drop down of your Google Docs. Then, the receivers would be able to view the shared document. And maybe within their email, ask for collaborator's privileges. "Along with "Attach a file", there should be a link "Include a file" which would give a drop down of your Google Docs." Or the ability to edit your emails in Google Docs. Is this text editor avaliable only in gmail,or its a package like Ms office. Presently has its problems and lacks theme editing, but omg, it has got the best embedded slideshows ever.